The course description section of the catalog includes a complete list of those academic/general education and career and technical credit courses available at North Lake College. To determine which credit courses are available during a specific semester, consult the college course schedule. There are two categories of courses: (1) academic courses and (2) WECM or technical courses. The actual course prefix/number has a specific meaning or identifier for each number. The fourth digit indicates course sequence. To help meet your transfer needs, the college is a member of the Texas Common Course Numbering System Consortium. Course descriptions will indicate if a course has been assigned a common course number. The common course number facilitates the transfer of these courses between and among participating colleges and universities. All Texas community colleges, including the colleges of DCCCD, participate in this system. 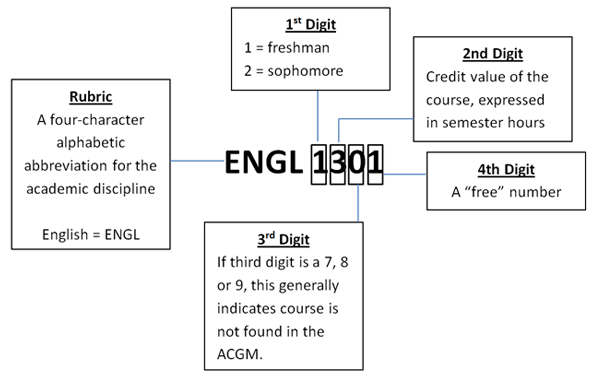 Most Texas public universities are cooperating with this numbering system by indicating which courses are equivalent to the common course number. Most course descriptions are developed based upon the descriptions published by the Texas Higher Education Coordinating Board (THECB). Academic courses are listed in the Lower Division Academic Course Guide Manual (commonly referred to as the ACGM). Career and technical courses are listed in the Workforce Education Course Manual (WECM). Academic courses (or general education courses) are freshman and sophomore courses that have been designated by the Texas Higher Education Coordinating Board for transfer among community colleges and state public four-year colleges and universities. These courses are found in the ACGM. The ACGM is a generic course inventory that also includes the official list of approval numbers for academic/general transfer courses that may be offered for state funding by public community and technical colleges in Texas. Courses listed in the manual may be offered and reported for funding without requesting approval from the Coordinating Board. If a community or technical college wish to offer a course not listed in the ACGM, or offer an ACGM course for more credits or contact hours than listed, a Unique Need Course Request for approval must be submitted to the Coordinating Board. These types of courses are listed on the colleges of DCCCD's Academic Unique Need Inventory. The state will not fund academic courses at community and technical colleges that are not listed either in the ACGM or on the college's Academic Unique Need Inventory. WECM (Workforce Education Course Manual) courses are courses that have been designated by the Texas Higher Education Coordinating Board as workforce education (technical) courses offered for credit and continuing education units (CEUs). These courses are not designed to automatically transfer to public four-year colleges and universities; they are designated to transfer among state community colleges. These courses can be found in the WECM. The WECM is a statewide inventory of workforce education courses offered for semester credit hours (SCH) and Continuing Education Units (CEUs). These courses are used by the college to respond rapidly to the needs of business and industry. The WECM offers a means for the college to continually design and update high quality workforce courses by receiving input from business/industry and community college faculty throughout Texas. The THECB approves all courses cited in the WECM for use by the Texas public community and technical colleges. Students who earn semester credit hours or CEUs by successfully completing requirements for the course(s) will be able to transfer the credits or CEUs to another Texas public community or technical college offering the same course(s).